The perfect Tote Bag for those tight budgets! 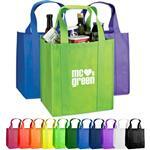 Durable, Recyclable and Attractive! Available in 13 colors! With a 22" Handle Length and made of strong 80 GSM Nonwoven Polypropylene, this tote features stitched seams, hemmed opening, reinforced handle stitching. 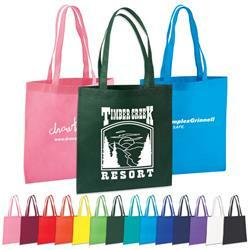 This tote bags are 100% recyclable and made of 40% pre-consumer recycled contents and 60% post-consumer recycled contents. 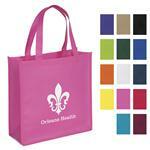 FREE 1-DAY RUSH PROMOTIONAL ITEM! ON SALE! Production Times Available: FREE 1-DAY RUSH PRODUCTION AVAILABLE (One-Color Only)! Typical Imprint Area(s): Front Centered - 8" x 8"